as I comb out my hair. There is the book, the inkstone, the table. at Wu Ling, and beautiful. alone out on the water. Copyright 2016 Sam Hamill. From Crossing the Yellow River: Three Hundred Poems from the Chinese translated by Sam Hamill, published by Tiger Bark Press. Translator’s note: Li Ch’ing-chao (1084?-ca. 1151) is certainly one of China’s greatest poets, a genius of the tz’u, one of the most influential critics of her age, and with her husband, compiler of an immense catalogue of stone and bronze vessels. 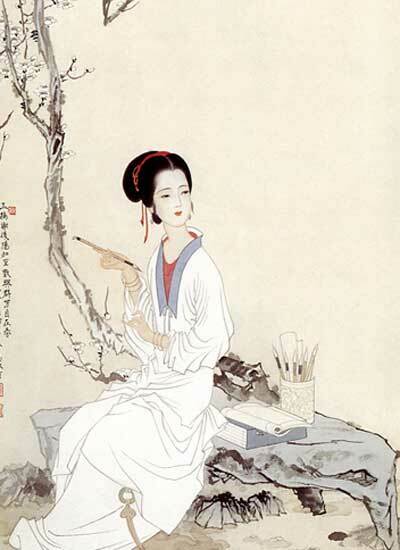 The death of her husband at an early age was emotionally and socially devastating to a “liberated” Li Ch’ing-chao, perhaps China’s first literary feminist. When her second husband proved abusive, she had the remarkable courage to leave him. Her form, tz’u poems, are new lyrics for old tunes: the equivalent in American vernacular of writing new words for On Top of Old Smoky. This entry was posted on March 26, 2018 by Vox Populi in Opinion Leaders, Poetry and tagged Chinese poetry, Li Ch'ing-chao, Sam Hamill, Song dynasty, To the Tune: Spring at Wu Ling.